What do you get when you adopt a senior pet? Some pretty big benefits, according to local senior pet adopters. You get “I-love-you-no-matter-what” devotion. You get a loyal and grateful companion; a mellow buddy by your side; a friend who’s always happy to see you. And the advantages go beyond that. To celebrate all the good things that senior pets bring to life, Francisvale Home for Smaller Animals, the 103-year-old no-kill shelter in Radnor, and Petfinder, the popular pet adoption site, are celebrating November as Adopt-A-Senior-Pet Month. And celebrating is the word. 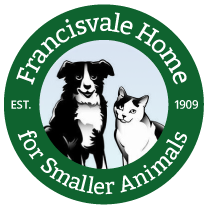 Francisvale adopters who have taken home older pets can tell you it’s a win-win. Like Mosely and Grizwold, seasoned pets don’t ask for much. Just that one special home to cherish them, a warm place to sleep, good meals and plenty of love. They’re often content just to watch what’s going on in the living room or outside the window. Like Lucy, an elegant black-and-white longhaired cat who patiently waits at Francisvale for her “retirement home,” having lost her mom to cancer. Lucy positively coos when you pet her. And Myles and Fanny, a pair of Polish Lowland Sheepdogs who find themselves at Francisvale because of a divorce. They may be eight years old, but there’s nothing elderly about these happy, playful beauties. If you want to adopt a senior pet, call Francisvale at 610-688-1018. Photos courtesy Mary Hunt Davis Photography. This entry was posted on Thursday, November 1st, 2012 at 9:00 am	and is filed under News.